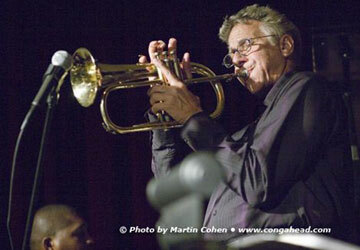 I was privileged to attend a rare appearance by Cuban multi-instrumentalist Bobby Carcassés. 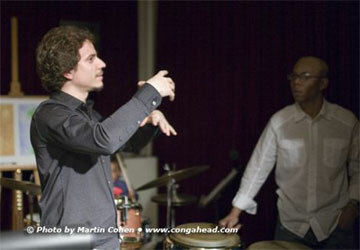 Bobby appeared at the Jazz Gallery in NYC, with an all-star lineup in a band led by virtuoso drummer Dafnis Prieto. The band consisted of Dafnis Prieto on drums; Osmany Paredas on piano; Yosvany Terry on sax; Yunior Terry on bass; Marvin Diz on conga; and Bobby Carcassés on flugelhorn, piano, conga and vocal. A highlight of the evening was Bobby completing two paintings during the performance of one of the tunes. I attended the second set, and the place was packed!